Vivify your Saturday night recreational drug use parties with LEDs and (pirated) MP3s. 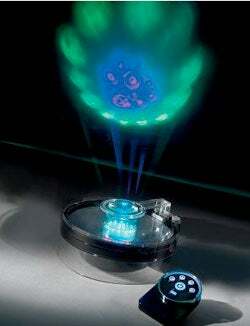 Once connected to an external audio source, Hammacher Schlemmer's Dancing Light MP3 Synchronizer puts on a light show rivaled only by Gatecrasher. The cylinder spins 'round and 'round, beaming onto a nearby wall or ceiling spectacular patterns and colors, all in sync with whatever music you choose to groove to. Glowsticks and sugar cubes not included.